Writer's Digest Books, 9781599637020, 311pp. Your first draft is a work of imagination, but that doesn't mean it's a work of art--not yet. With Jack Smith's technical and inspirational guidance, you can turn your initial draft into a compelling story brimming with memorable characters and a page-turning plot. 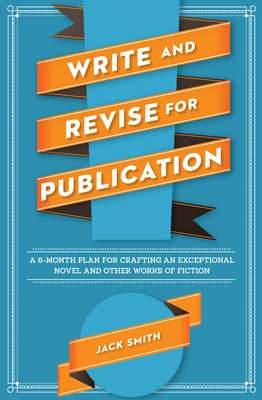 As Jack states inside Write and Revise for Publication, writing is a complex act, one that calls upon all the powers of our creative resources, imagination, and intellect. Top-notch storytelling is not achieved the first time around, nor should it be expected so soon. But it is possible. Through Jack's detailed instruction and precise methods, you will learn the revision techniques and fine-tuning skills needed to create powerful, polished works ready to submit to magazines, agents, and publishers. Jack Smith has an MA in English (creative writing concentration); and a Ph.D. in English (American literature). He writes fiction regularly and has sold to the North American Review, Texas Review, Southern Review, Night Train, X-Connect, In Posse Review, and others. His novel, Hog to Hog, won the George Garrett Fiction Prize and was published by Texas Review Press in 2008. His nonfiction includes twenty articles for Novel & Short Story Writer's Market. He's also written a dozen pieces for The Writer and has been published numerous reviews in such magazines as Ploughshares, Georgia Review, Missouri Review, Prairie Schooner, American Book Review, Pleiades, Texas Review, Mid-American Review, Iowa Review, and Environment magazine. In addition to writing, he has served for more than twenty years as Fiction Editor at The Green Hills Literary Lantern, a literary journal published by Truman State University.